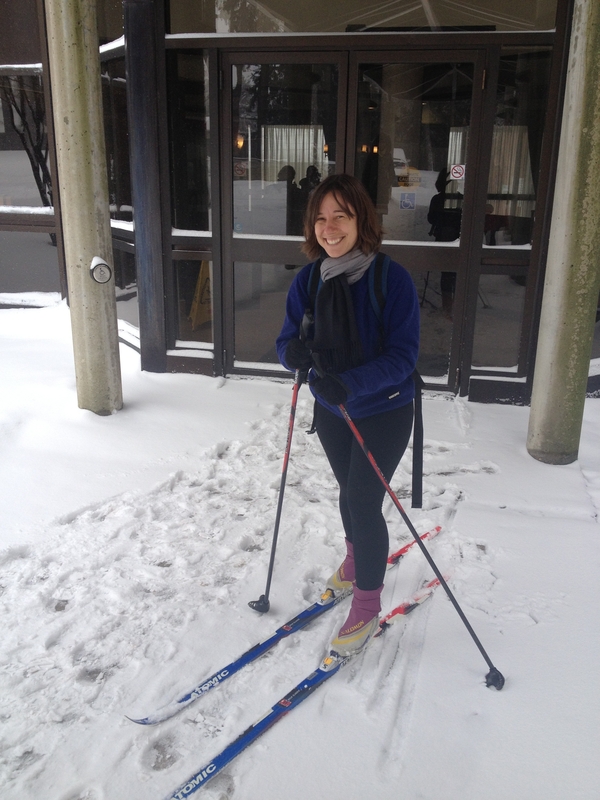 Erin Nelson is a Postdoctoral Fellow at the University of Guelph’s ICES/The Research Shop. A specialist in food security and sustainable food systems, one of the projects she is currently coordinating focuses on supporting efforts in Ontario to connect children and youth to good food, through experiential education, school meal programs, and other innovative endeavours. Erin Nelson est stagiaire post-doctorale à l’ICES/The Research Shop de l’Université de Guelph. Spécialiste en sécurité alimentaire et en systèmes alimentaires durables, elle coordonne présentement un projet ontarien qui soutient les efforts de mise en contact des enfants et des jeunes avec la nourriture saine. Cela se fait à travers l’éducation expérientielle, les programmes alimentaires scolaires et d’autres initiatives innovantes. Many people probably remember this past February 8th – the day that Winter Storm Nemo (or “Snowpocalypse”) hit Ontario, shutting down roads, leaving people stranded in airports, and causing school closures, among other things. As a Postdoctoral Fellow at the University of Guelph’s Institute for Community Engaged Scholarship (ICES), my normal reaction to the university’s decision to close due to extreme weather would be glee. (I truly love my job but, as a lifelong winter enthusiast, I love a good snow day as well.) Unfortunately, February 8th was the day I had scheduled the “Say ‘Yes!’ to Good Food Education Design Charrette” – the cornerstone event of a KTT project I’m coordinating. With funding from the Ontario Ministry of Agriculture, Food and Rural Affairs (OMAFRA) KTT Funding Program (part of the Ministry’s partnership with the University of Guelph), the Good Food Education Project involves collaborative research and KTT to promote efforts aimed at connecting children and youth in Ontario to ‘good food’, or food that is healthy for people, the environment, and the province’s farm economy. The main community collaborators on the project are Sustain Ontario, Ontario Agri-Food Education (OAFE), FoodShare, and Everdale Organic Farm and Environmental Learning Centre; however, many more stakeholders from Ontario’s food education sector – from teachers and school boards, to public health units, to non-profit agencies, to policy-makers – have been involved as well, and much of the project work is being done by volunteer graduate student interns at ICES’ ‘Research Shop’. All of us were incredibly excited to be coming together for a full day of networking, information-sharing, and collaborative planning, so the 6am announcement of a snow day – and automatic cancellation of the event – was a big disappointment. By 8:00 am I had checked in with Sustain Ontario Director Ravenna Nuaimy-Barker. She was already in Guelph, along with steering committee members of Ontario’s new Child and Youth Food Network, who had travelled from across the province for a day of strategic planning ahead of the charrette. They were all gathered at their hotel, so we decided to make some knowledge mobilization happen in spite of a winter storm’s best efforts to stop us. I strapped on my cross-country skis and headed out to meet them. My frustration at the weather’s bad timing was alleviated by the cheerful encouragement I received from passersby as I made my way through the snowy streets to the Best Western, where I arrived somewhat disheveled with a thick coating of ice on my hair. The journey was well worth it, as I had the chance to engage face-to-face with people who have a direct stake in the food education work we are doing. They were enthusiastic about the research that has been done to date – eager to share results online and use them to aid their action planning. That enthusiasm, and everyone’s evident passion for good food education, was infectious, passing to me and, at a meeting the following week, to the project interns. We are all now busy planning for the rescheduled charrette, which will be held Friday, April 19th at Guelph’s Arboretum Centre. If anyone is interested in learning more about the event, or the Good Food Education project in general, feel free to contact me. I’m also happy to provide tips on extreme winter weather knowledge mobilization strategies. Way to go, Erin! A great story. It was a pleasure meeting you recently in Guelph and learning about the important work you’ve done in KMb. You’ve given us all a good name with that level of service and commitment! !